FILE - Democratic presidential nominee Hillary Clinton waves to delegates before speaking during the final day of the Democratic National Convention in Philadelphia, July 28, 2016. Hillary Clinton was the obvious choice for the Democratic Party before it began nominating its candidate for president. In the days before Tuesday's election, a wide range of national polls gave her a slight edge over Donald Trump. She had the type of political experience that historically has been a path to the White House. When voters had their chance to have their say at the polls, Clinton lost in her bid to become the first woman elected president of the United States. Supporters watch the election results during Democratic presidential nominee Hillary Clinton's election night rally in the Jacob Javits Center glass enclosed lobby in New York, Nov. 8, 2016. Clinton's campaign chief John Podesta told supporters at her rally in New York City to go home at 2 a.m. Wednesday, before the race had been officially called, saying votes were still being counted and that there would be more to say later in the day. "I want every person in this hall to know and every person across the country who supported Hillary to know that your voices and your enthusiasm mean so much to her and to [running mate Tim Kaine] and to all of us. We are so proud of you and we are so proud of her," Podesta said. The rally was at the Jacob Javits Convention Center, a venue that featured the imagery of its vast glass ceiling and what a Clinton win would symbolize. Clinton supporters went from jubilant Tuesday evening after the playing of the national anthem to slowly accepting the reality of what was happening as the night went on. 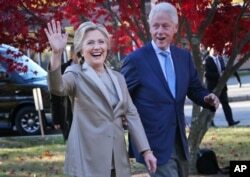 Democratic presidential candidate Hillary Clinton, and her husband former President Bill Clinton, greet supporters after voting in Chappaqua, N.Y., Nov. 8, 2016. VOA's Ramon Taylor said there were glimmers of hope from the crowd during the night, such as when the state of Virginia was called for Clinton, but that those died out quickly, even as the thumping, upbeat soundtrack of Katy Perry and Bruno Mars played on. After midnight, with the math for a possible Clinton win looking more and more difficult, some people started filing out and none were in the mood to talk to reporters. A similar scene unfolded at a bar in Philadelphia, where Clinton supporters chanted "I'm with her!" early on and became silent as more and more states went to Trump. VOA's Katherine Gypson said the crowd appeared stunned as the restaurant closed for the night. Clinton's campaign massively outspent Trump's and had a big advantage when it came to workers and volunteers mobilized to convince voters in states across the country, both of which helped fuel the predictions that she would defeat Trump. Democratic presidential candidate Hillary Clinton hugs her husband, former President Bill Clinton as their daughter Chelsea Clinton looks on during a campaign rally in Raleigh, N.C., Nov. 8, 2016. But Clinton also dealt with widespread unpopularity among voters, with polls showing that a majority did not find her trustworthy. Questions about her use of a private email system when she was secretary of state never went away, persisting in debates, Trump's rallies and media reports through the final week of campaigning. Irfan Nooruddin, a professor of politics at Georgetown University, said Clinton and her team tried to dispel those concerns, but ultimately could not. "I think what we've seen tonight is that for a lot of voters, that baggage of Clinton was just too much to overcome," Nooruddin told VOA. He said animosity toward Clinton pushed white, rural voters to vote in ways unseen before, and that she was less successful than she had hoped in carrying the young people and African Americans who helped elect President Barack Obama. Democratic presidential nominee Hillary Clinton speaks at a campaign rally in Pittsburgh, Pennsylvania, Nov. 7, 2016, the final day of campaigning before the election. 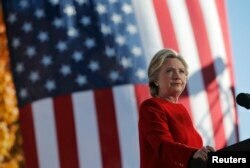 Clinton served as secretary of state during Obama's first term, and Republicans, including Trump, often portrayed her candidacy as a run for a third term of the Obama administration. David Schultz, a political science professor at Hamline University, said the 2016 vote reminded him of the 1980 election in which a lot of voters who made up their minds in the final days of the race voted for challenger Ronald Reagan over incumbent President Jimmy Carter. "Here I sort of think of Clinton as the incumbent, that is same party as Obama, and there seems to be evidence voters are breaking away from the incumbent towards the challenger because they don’t like the direction that the country is going," Schultz said. Clinton had an advantage when it came to support from female voters, but Trump always had more support among men throughout the race, particularly whites. Schultz said sexism is part of the story of this election. "There is I think still a large percentage of our population that won't vote for a woman for president of the United States. Exactly what it is, I don't know. I don't think the polls are reflecting that either," he said.